Wonder Woman #53 Review - Wondrous! Wonder Woman #53 Review – Wondrous! Verdict: 4.1 / 5A vibrant and stellar read, the adventure with these heroes continues on strong footing as they journey further into Aztec wonder. 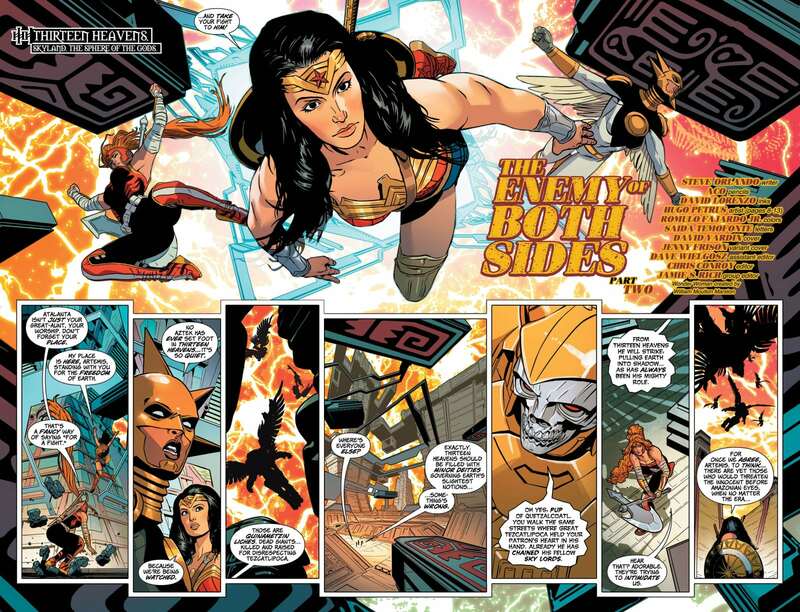 Wonder Woman #53 concludes this short saga with Tezcatlipoca, a shadowy Aztec god of war and destruction that seeks to cast the Earth into a darkness that it will never return from. 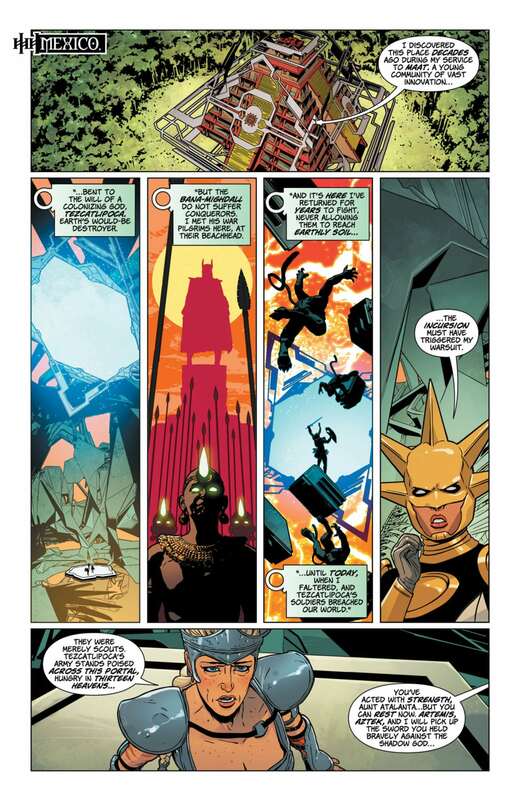 After finding Atalanta fighting for her life and the Earth’s chance of keeping to the light and avoiding the dark, Wonder Woman, Aztek and Artemis have now ascended to the Thirteen Heavens in order to vanquish the huge and godly threat to the planet. To do this, egos must be set aside, bravery must be sought from deep inside these warriors and intelligence must be used to the best of their abilities. The true narrative arc of this adventure is the bond between these three female fighters. Never totally on the same page, each is strong in their own right and represents both similar yet totally different viewpoints and lineage. Warriors in their culture, they are cut from the same cloth but certainly from different corners. Each had a heroes moment that propelled their story forward in the fight against the evils of the Aztec world. The battle with the guards of the Thirteen Heavens is quickly cut short, perhaps disappointingly, by cutting straight to the big bad. The battle with Tezcatlipoca was epic, however, with the bow of Ra utilised by all three of these heroes in order to share the brunt of its deadly force. One hero wielding this would have burnt them up, but all three sharing their strength, much like the narrative itself, was the key to bring down this shadowy villain. 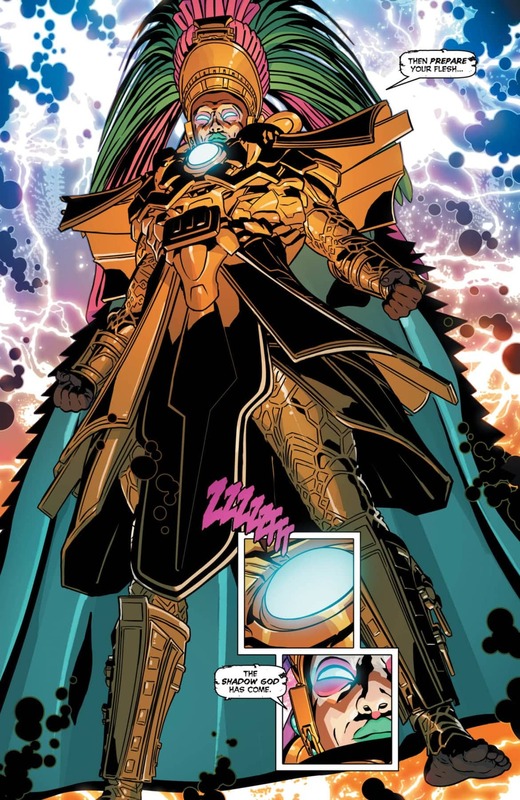 The most interesting part of this tale is the concept that this monster has been fighting them in a hyper moment, in every time and every multiverse, showcasing an array of different versions of the heroes set before us. This is a threat that will not die easily, with there being no surprise that the Aztec god will likely reappear in a different from, having already shown both a false and true image of itself. With the villain vanquished and the heroes returning home, it seems natural that Atalanta is returned to Themyscira her true place of residence. How welcoming those who dwell there will be to these returning guests is yet to be seen, however, it did not seem like a favourable party that will greet them upon landing. The conflict that is set to rise there will continue the dynamic that has successfully been set up within this team of four. Much like the epic nature of its story, the art here is also stellar, capturing the rich colours and colour of the Aztec people whilst balancing it with the rich tones of the Greek pantheon that the other characters represent. It is always fun exploring the other gods and obscure worlds of the DC Universe, especially then diving into the multiverse version of all of these places and characters. This has been a great duo of issues and I’m intrigued as to where the tale takes us next. Wonder Woman #53 continues to be as wondrous as its title suggests, with good character interactions, epic battles and a vibrant piece of art on every page.